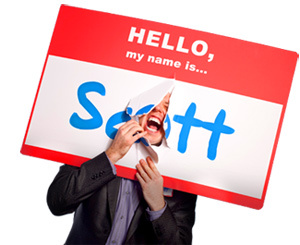 The Difference between Content Expertise and Core Expertise - HELLO, my name is Scott! You have two kinds of expertise. It’s topical. It’s a field of study. It comes from your head. It comes from what you KNOW. And, you deepen your Content Expertise through learning, reading, writing and teaching. It’s a practice. It’s a way of being. It comes from your heart and soul. It comes from who you ARE. And, you deepen your Core Expertise through being, living and practicing. 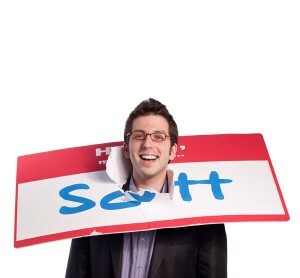 The nametag is about approachability in its CONTENT – because that’s what I’ve learned and researched and experienced from wearing it 24-7. But at its CORE, the nametag is about something bigger. I didn’t start to realize this until about five years into it, when it occurred to me that it’s not about the nametag. It’s about sticking yourself out there. It’s about sharing your truth with the world. It’s about being yourself and honoring your truth. It’s about asking questions most people don’t ask. It’s about creativity and fun and childlike enthusiasm. It’s about not asking HOW or WHY, but learning to just go. It’s about getting out of your comfort zone on a daily basis. It’s about becoming an expert at learning from your experiences. It’s about excavating your passion and uncovering your uniqueness. It’s about the difference between being having ideas and executing ideas. It’s about leading with your person and not your profession or job title or label. It’s about holding yourself personally accountable by painting yourself into a good corner. It’s about choosing to make a name for yourself – to label yourself FIRST – before other people get a chance to. It’s about the entrepreneurial leveraging of a simple idea into a saleable product, a adventurous career and a worldwide movement. It’s about creating an product or idea that people can stumble upon, obsess over, fall in love with, become addicted to and tell their friends about. It’s about being an advocate for comfort, diffusing defensiveness and reducing the threat in a fear-driven, fast paced, untrustworthy, unfriendly society. That’s what the nametag is REALLY about. Approachability? Sure. That’s huge. That’s the content. At the CORE, however, there’s something deeper, stronger and more enduring. What about you? What’s it about for you? What’s it NOT about for you? I challenge you to think about the two dimensions of your expertise – your Content AND your Core. Both what you know AND who you are. How does your Content Expertise differ from your Core Expertise? For the list called, “31 Questions to Turn Your Expertise into Money,” send an email to me, and I’ll send you a list for free! Check out Scott’s Online Quotation Database for a bite-sized education on success!